It�s really amazing how much free content is available by using podcast. There are several thousand podcasts in iTunes for free. The great thing about podcasts is you don�t have to download them and take up space on your iPad or iPhone. Of course, you can download them if you want to do so, but the podcasts will stream �from iTunes to your iPad, iPhone, iPod touch, computer and Apple TV. 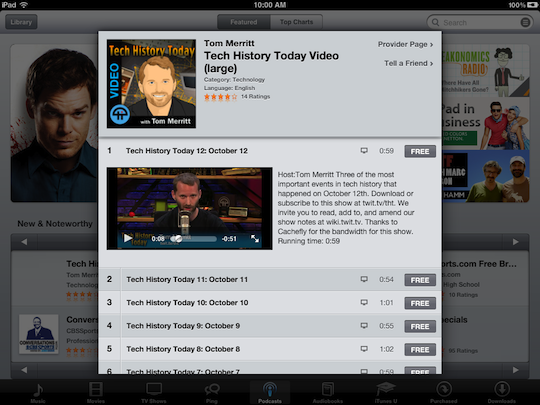 To get started watching podcasts on your iPad, open the iTunes app and tap podcasts at the bottom. When you find one you want to watch, tap the title for more information and the option to play the podcast. Once the video stats playing you have the option to expand the video by touching the arrows at the bottom right of the screen. If you choose to download the podcast you can do so by taping Free, then Get Episode. Audio podcast are accessible in the Music app by tapping More then taping Podcasts. 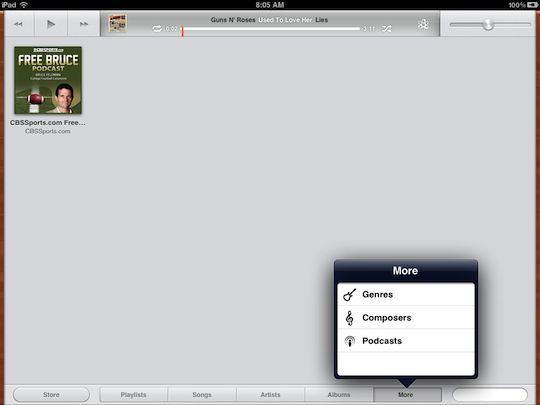 You will need to have at least one podcast for the Podcasts option to show up. If it is a video podcast you will be able to find it in the Video app after its been downloaded. I also noticed that there is not an AirPlay option for podcast but I guess that feature would be redundant since Apple TV has the ability to watch podcasts built in.